Guaita Tower in San Marino photo. Tower (Castle) Guaita is the oldest tower in the republic of San Marino. The tower was built in the 11th century and then rebuilt several times. The tower was used as a prison. The fortress has two rings of walls. The inner wall is the oldest. On the castle territory is located the chapel of St. Barbara (Cappella di Santa Barbara). 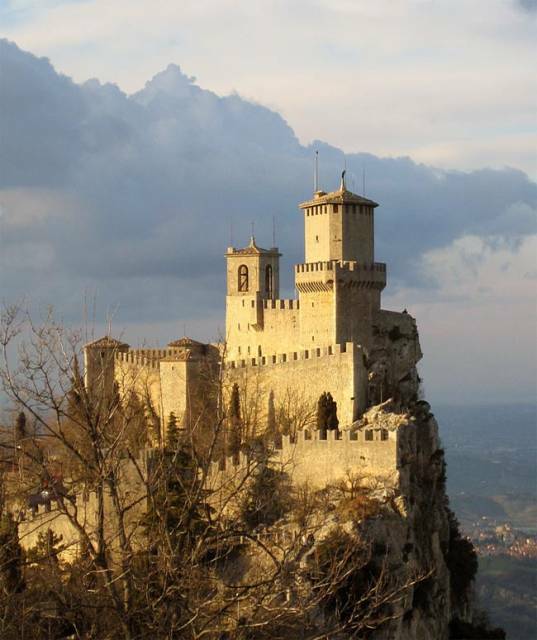 The main attractions of San Marino are three towers (fortress): Guaita, Cesta and Montale. Towers are located on Titano Mount. Guaita Tower is located the first, on the way of tourists. From the mountains (if weather permitting) offers beautiful views of San Marino, Italy and the Adriatic Sea. San Marino is a small country on the Italy territory near the town of Rimini. It is one of the smallest countries in the World.